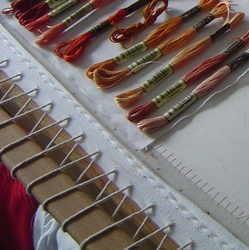 Sew this tape down the sides of your embroidery fabric once it is sewn onto an embroidery frame and lace to the frame with string to make your fabric really taut to work on (see picture below). You can reuse each piece several times, just turn the tape around each time you sew it on! This white cotton tape is available in 38mm & 25mm widths for various size projects. Price is per metre of tape and will come in separate metre lengths unless otherwise requested.